I’ve been using Google’s Pixel XL smartphone for a few weeks, and it’s been highlighting the iPhone’s glaringly lacking key features.You should note that everything here is subjective. The iPhone has great features that the Pixel doesn’t have, and the Apple ecosystem is in a league of its own. But damn the Pixel is good. You should also note that I’m comparing the Pixel XL experience with my iPhone 6s and not the iPhone 7 series. That’s because I have more experience with the 6s Plus, as it’s been my phone for the last 9 months. 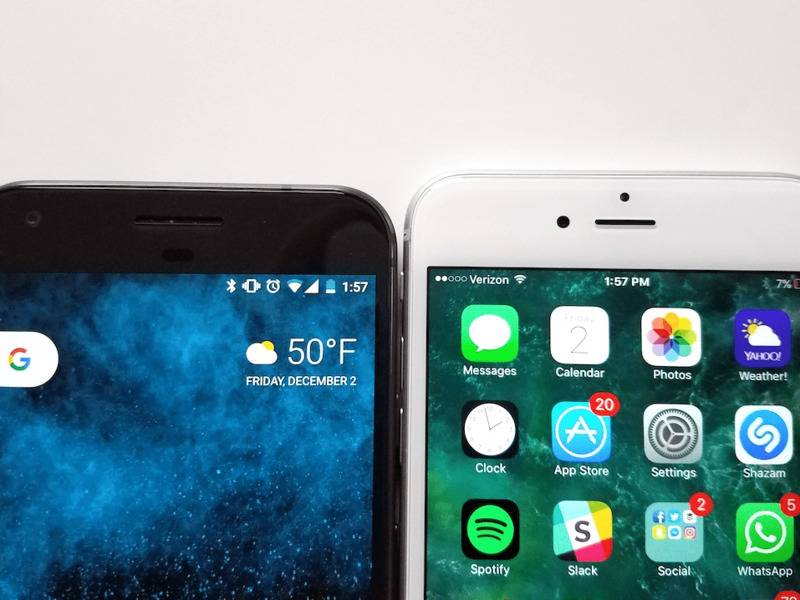 On top of that, the iPhone 6s Plus isn’t that much different, as a whole, than the iPhone 7. The performance between both phones is still comparable, and the 7’s camera upgrades aren’t as important as some of the Pixel’s more functional features. 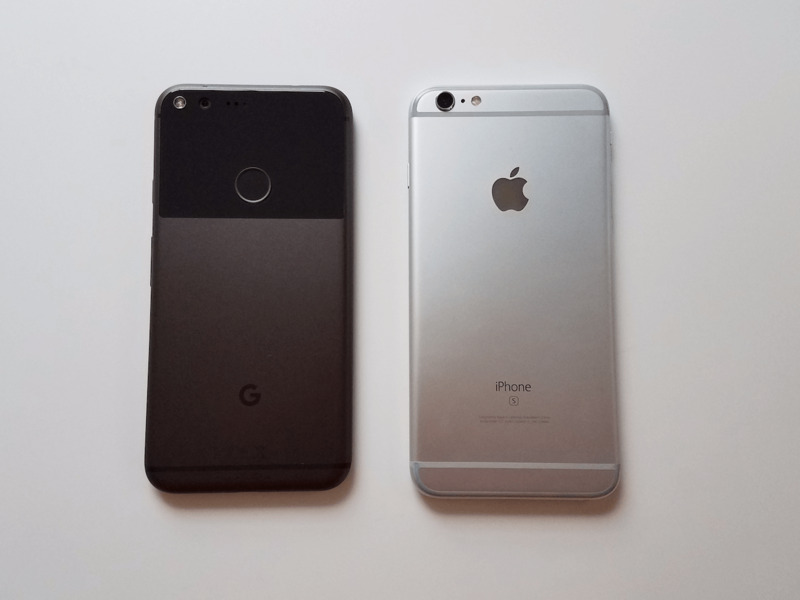 My iPhone 6s Plus’ weight (192 grams) never bothered me until I picked up the Google Pixel XL (168 grams). The iPhone 7 Plus is slightly lighter than the 6s Plus at 188 grams, but only by 4 grams, so I’d still consider the 7 heavy compared to the Pixel. 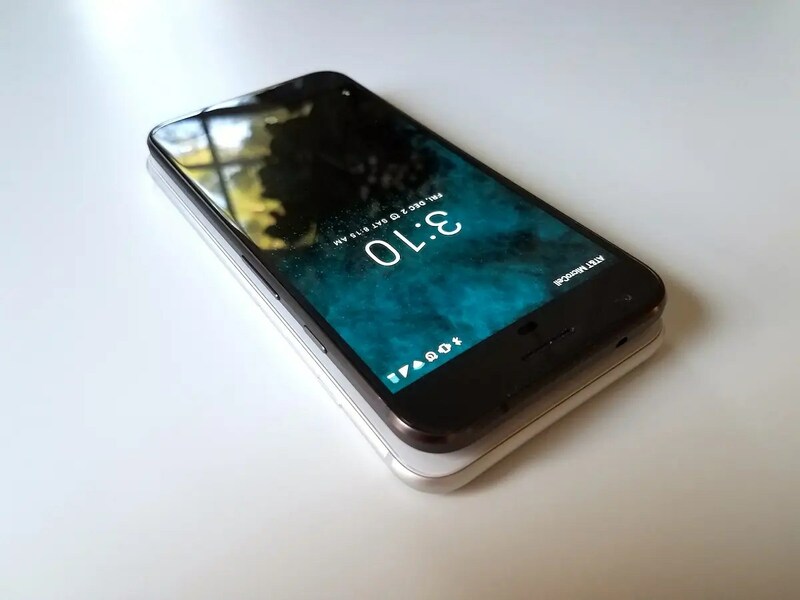 The Pixel’s lighter weight has no ill effect on its reliability, and it’s easier to manage in your hands. The Pixel’s screen is stunning. 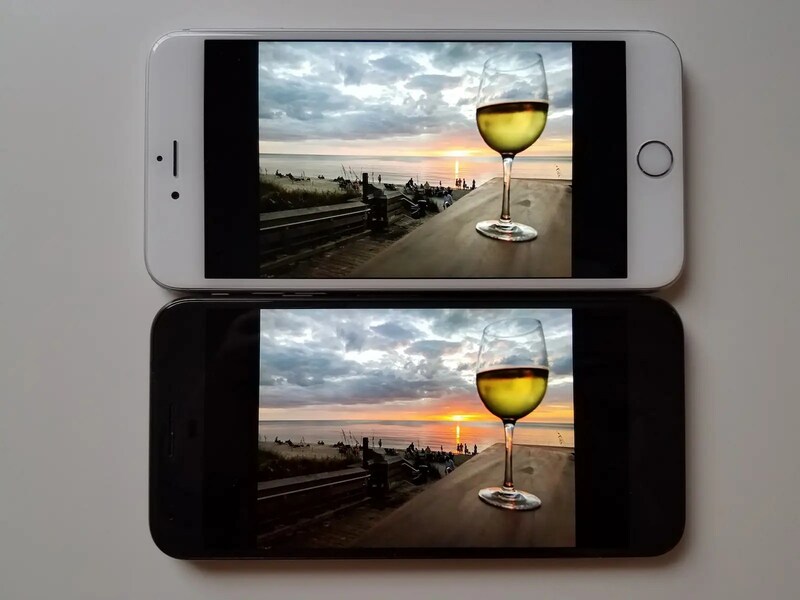 Above, the Pixel XL and iPhone 6s Plus are showing the same photo on full brightness (taken with the Pixel, by the way). The iPhone’s LCD screen is nice, but the colors aren’t as rich, and the contrast isn’t as pronounced as on the Pixel’s AMOLED display. The Pixel’s design is more utilitarian than it is beautiful, but its sharper AMOLED screen outshines the iPhone’s Retina display. The iPhone 7 Plus has a 1080p screen that’s fine and sharp enough, but the Pixel’s 1440p screen is sharper. More importantly, the Pixel’s AMOLED screen makes everything it displays look better than on the iPhone’s LCD display. Pictures, videos, and apps pop with inky blacks and vibrant (but not oversaturated) colors on the Pixel, which makes for a more premium and modern look overall. The Pixel has a clever way to add grip. I don’t like cases, but I have to use one for my iPhone. As nice as the iPhone’s metal back and edges are, they don’t offer any grip, and I’ve dropped and dinged my iPhone a couple times as a result. The glass inlay on the Pixel’s back doesn’t look particularly nice (it looks better on the white model), but it’s actually a great grip for your index finger, which makes the Pixel feel more secure in your hands as you hold it. 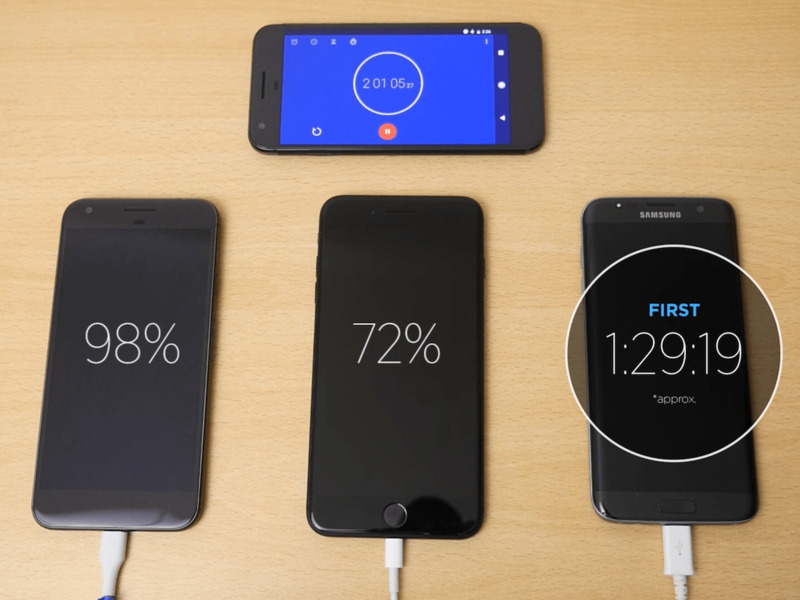 Above, SuperSaf TV, a tech YouTube channel, tested the charging times of the Pixel XL, iPhone 7 Plus, and Galaxy S7 Edge with the chargers included in each phone’s packaging. After two hours of charging, the Pixel XL is nearly 100 percent charged while the iPhone 7 Plus is dragging its feet at 72 percent. Meanwhile, the Galaxy S7 wiped the floor with the other two, having charged to 100 percent after an amazing one hour, 29 minutes. Fast charging is actually a huge deal. The Pixel’s USB-C fast charging is faster than the iPhone’s comparatively slow charging, and it’s one of the harder things to adjust to when I switch back to the iPhone. I can choose to make the Pixel work faster. 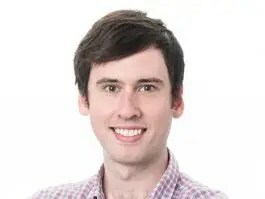 I can adjust Android to make it feel faster than iOS by cutting down, or removing altogether, the animations when I open apps and swipe between screens. iOS, on other hand, won’t let me touch its animations. Pixel has better battery life, thanks to Android. Android’s Doze feature is exceptionally effective. It does a fantastic job of reducing the Pixel’s power consumption when I’m not using it compared to iOS on my iPhone. The Pixel is slightly smaller, but has the same size screen. The difference is slight, but it’s there and noticeable on a device you hold and use multiple times a day. The iPhone is in the lower end in terms of screen-to-bezel ratio (67.7 percent) compared to the Pixel XL (71.2 percent). I simply get along better with Android than I do with iOS. Apple still hasn’t figured out how to show me notifications in iOS as well as Android does. 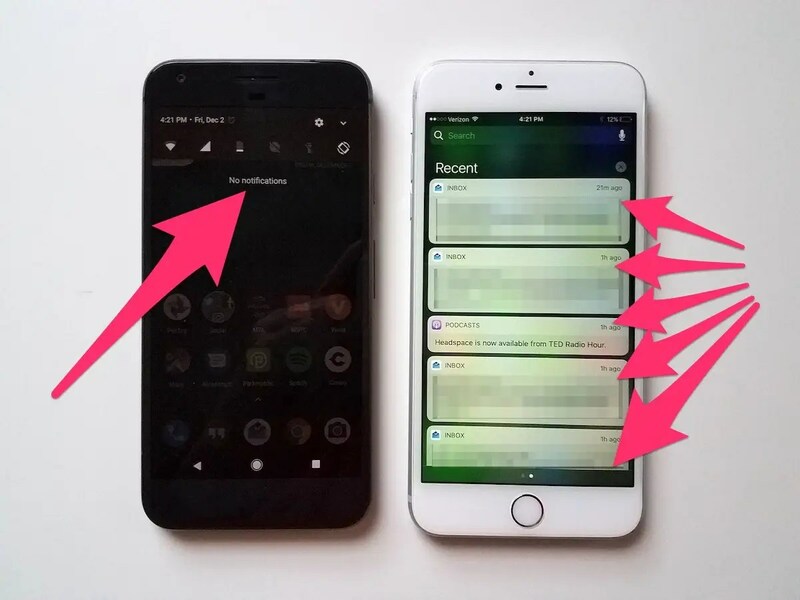 They’re easier to manage from the Android lock screen, where I can clear notifications away with one swipe compared to iOS’ swipe-and-tap to clear. I can also pull down on the notifications to peek at more details compared to iOS, too, which doesn’t show me very much. Notifications also manage themselves better in Android. For example, when I open a new email or Hangouts conversation on my computer, Android will automatically clear those notifications on the Pixel, whereas the notification remains on my iPhone until I manually clear them. It’s also impossible in iOS to swipe up the control panel for things like changing the brightness when the on-screen keyboard is on. On Android, I can easily swipe down from the top of the screen to get access to the most important settings from any app, whether the keyboard is on or off. The universal back-button that simply brings you back to the last screen or page you were on is incredibly useful, as it’s always in the same place. On iOS, the back button for apps and screens can differ from app to app. There’s also the usual “I can hide my apps in the app drawer and put them wherever I want on the home screen” customization argument, which has been a classic Android argument since its release. Finally, for those who use voice-activated assistant, Google’s Assistant has proven to be far more advanced than Siri, too.